DAVOS, Switzerland — President Donald Trump arrived in Switzerland on Thursday, ready to play salesman during his debut appearance at an annual economic summit in the Swiss Alps and argue that his “America First” agenda can go hand-in-hand with global cooperation. Trump arrived in Zurich ahead of schedule and immediately boarded a U.S. helicopter for the flight to Davos, where the World Economic Forum is being held. 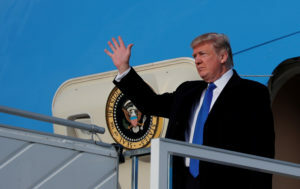 The approximately 40-minute trip took Trump over a snowy countryside dotted with houses, frosted mountains and a glistening lake. As Trump got off the helicopter, he gestured to aides who held him by the arms as he walked to his waiting car. U.S. Treasury Secretary Steven Mnuchin got to Davos ahead of Trump and insisted Wednesday that the United States supports free trade. U.S. Commerce Secretary Wilbur Ross argued that new U.S. tariffs on imported solar-energy components and large washing machines are meant to deal with “inappropriate behavior” by other countries and are not protectionist. Still, Ross conceded that China could respond by imposing its own tariffs on U.S. products. The president is set to address the forum Friday. He is expected to showcase the booming U.S. economy and measures like his recent tax overhaul, claiming that a thriving America benefits the world. A vocal critic of trade deals he sees as unfair to the United States, Trump will also stress the need for what he sees as fair competition. The invitation-only event focused on global cooperation and free trade seems like an unnatural fit for Trump, who rode a wave of nationalistic angst to the White House. But Mnuchin dismissed any concerns that the president may get a cool reception. “We don’t have to worry about this crowd,” he said. During his two-day stop, the president will attend a reception in his honor, host European executives for dinner and meet with world leaders. He plans to sit down with British Prime Minister Theresa May, Israeli Prime Minister Benjamin Netanyahu, Swiss President Alain Berset and Rwandan President Paul Kagame. The meeting with Kagame comes not long after participants in a White House meeting said Trump had referred to African nations as “shitholes.” Trump also was criticized in Britain for retweeting videos from a far-right British group. He also criticized London Mayor Sadiq Khan following a terror attack last year. Trump canceled plans for a recent trip to London to open the new $1 billion U.S. embassy there, a move that avoided protests promised by political opponents. The president said he skipped the trip because he was unhappy with the new embassy’s cost and location. National Security Adviser H.R. McMaster said the United States continues to have a “special relationship” with Britain. He said Trump will discuss security and economic issues with the Rwandan leader, who chairs the African Union. Trump concluded 2017 with the passage of a major tax overhaul, a key policy achievement. But the first few weeks of 2018 have been defined by political battles over government spending, Trump’s incendiary Twitter feed and explosive revelations in a new book that portrays Trump as an unstable leader. A brief government shutdown threatened to derail the Davos trip altogether. The president has criticized global pacts, withdrawing from the Trans-Pacific Partnership on trade, demanding changes to the North American Free Trade Agreement and announcing his intent to exit the Paris climate accord. In the lead-up to Trump’s arrival, other leaders at the meeting have argued against any drift toward protectionism in the global economy. Indian Prime Minister Narendra Modi said new barriers to trade could pose a danger on a par with climate change and extremist attacks. And Canada’s Justin Trudeau revealed that his country and the 10 remaining members of the Trans-Pacific Partnership have revised their trade deal following the U.S. withdrawal. Trump’s top economic adviser Gary Cohn rejected the suggestion that the United States had pulled back from international cooperation.